Brick By Name, Brick By Brain? The unwitting star of the internet this week is the “award-winning” TV producer, writer and journalist Samantha Brick who has managed to alienate almost everyone with her articles on her experiences as a “pretty” woman with “a pleasing smile”. Her first article for The Mail describes how she regularly has bottles of bubbly sent to her table in restaurants from strangers, whilst other men have presented her with flowers, paid for her taxi fare or bestowed other gifts upon her. And the reason why? Her “lovely looks”. But all is not well. It seems that other women are envious of her good looks and hold over men. She’s been dropped by friends who are worried that their husbands fancy the idea of cementing a sexual liaison with Brick. And her attractiveness has also caused her to be overlooked for promotion at work. But, worse of all, she has never been asked to be a bridesmaid by her friends. Oh, the horror! There are plenty more examples in her article of the abuse that she claims to have received from other women, purely because she is “the most attractive woman in the room”. Apparently there is no end to the vitriol from the sisterhood. So just how stunning is this woman? Well, only slightly above average I would say. And it appears that the general public share this view. Thanks to her articles going viral around the world, she now has a new army of female ‘haters’, many of whom have felt compelled to leave comments on The Mail’s website, telling her exactly what they thought of her musings. There are over 5000 comments to be precise! Obviously some are also from men, but the consensus is the same. She is widely perceived as conceited, delusional and self-aggrandising. Unbelievably, a mere day after her ill-advised article, Brick was mortarfied at the responses and thought it was a good idea to publish another article, claiming that the inevitable backlash “just proves I’m right”. Er, no, it doesn’t really, does it? And rather than Brick trying to build firm support by adopting subtle, more modest language, she simply repeats her claims with flimsy foundations. So, one has to ask, is Brick’s argument a construction of her imagination? It seems at least partly so. Although her anecdotal evidence can’t be supported, she must have perceived her experiences to be a product of her looks, regardless of whether or not the men’s intentions were carnal. But clearly Brick’s presumptions have put walls between her and female companions. Dare I suggest that she has a mild case of narcissistic personality disorder? This is characterised by an individual being excessively preoccupied with issues of personal adequacy, power, prestige and vanity. It is manifested by a person exaggerating his/her own achievements and housing unrealistic fantasies of success and beauty. It is also characterised by a failure to take on board the opinions of others. In addition, a sufferer of NPD also has relationship troubles, is selfish and seeks constant reassurance from others. As Ms Brick lived her life by the advice of psychics for a prolonged period, even divorcing her husband and painting her hallway yellow after consultations, maybe I have a point. But then, maybe not. I don’t know Ms Brick personally, so I am in no position to judge. But the evidence, on paper, does look damning. Clearly she is an articulate woman who is confident enough to express her true feelings to the public. 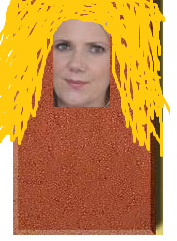 So she’s certainly no brick-for-brains. Possibly she is only guilty of a lack of modesty and poor judgement. One thing’s for sure, I bet she wishes she didn’t write the articles now. Or maybe not, seeing as she has now appeared on television to defend herself. Oh dear. Quite a likely reason. Thanks for your comment. The whole story is very strange if you ask me. I have stayed away from the whole debacle really. Wouldn’t want to outshine her beauty, you see. Quite right too, she deserves the limelight. Her article was devestatingly hilarious. I love when things backlash like this, but as a ridicuslously attractive woman myself, I totally relate- I nearly drowned with all the free champage I recieved last year.